Previously, users of touch screen devices had to select dates from a Calendar tool. It is now possible to simply type in the desired date. When a portal user needs to reset their password from within the application, they are now required to input their current password to do so. There is now a 'Beta' tag marking integrations that are at this stage of development. The Portal supports multi-currency. Based on the users home location, they can only book meeting rooms at locations with the same currency as their home location. Billing mangers can now export all transactions, for all Organizations managed within the same Operate account. Under all export areas, there is now an option to select all trasactions or choose a date range. We have added a Cookie Notification to Operate's Login page (operate.essensys.tech). Can edit activated licences – Allows users to edit an activated licence. Users with this option would still have the ability to renew and transfer licences. Enable licence renewals – Will allow a user to create a renewal licence (through the renew button), however they will not be able to edit or make any changes to an existing agreement, unless "Can edit activated Licences" is also enabled. Enable licence transfers - Will allow a user to create a transfer licence (through the transfer button), however they will not be able to edit or make any changes to an existing agreement, unless "Can edit activated Licences" is also enabled. Under Settings > System > Operate Settings > General Settings, there is now a field called "Lock List Price on Licences" which will gray out the List Price field on Licence items. This is useful when you do not want your staff to be able to change the list price of a Licence item. Please note that if you have discounts active, these can still be used, but can also be subject to approval if you choose to. You can now add your email signature to any template, as a merge field. This allows you to ensure that the signature is always there and your templates do not overwrite it. To add the field, select Current User > Email Signature, when creating or editing an email template. The email inbox in O[erat previously included emails received by all users under the same organization. There is now a filter available, which allows you to narrow down the list of emails to those sent to yourself or any other user. When customers make a portal purchase, the emails they receive are now also recorded within their Accoun't Activity History section. When a user is in the email notifications folder, they will see a new filter which allows them to filter by user. When using the quick update button to update products, if the user chooses an option which is a Lookup List, (i.e. Retainer Product), there is now an option to select 'Not specified' so users are able to bulk remove values from these fields. 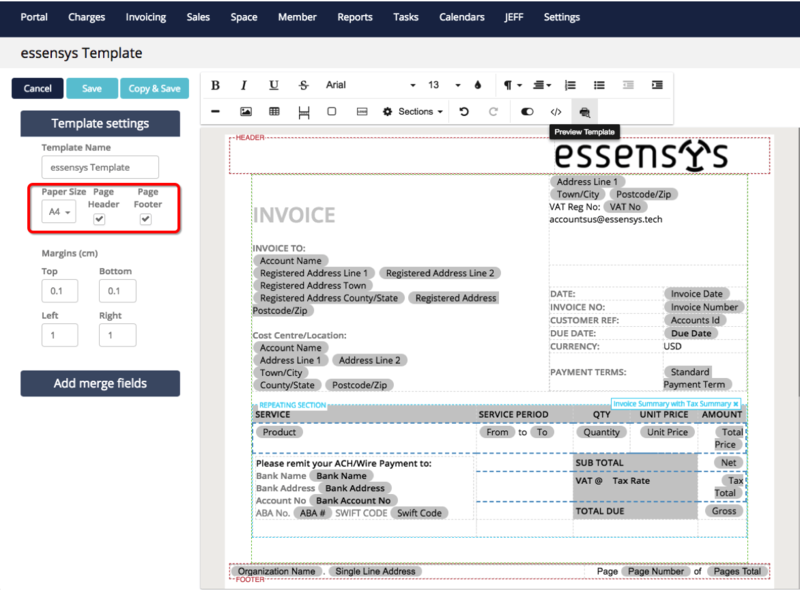 For more seamless invoices Operate now groups similar services together. 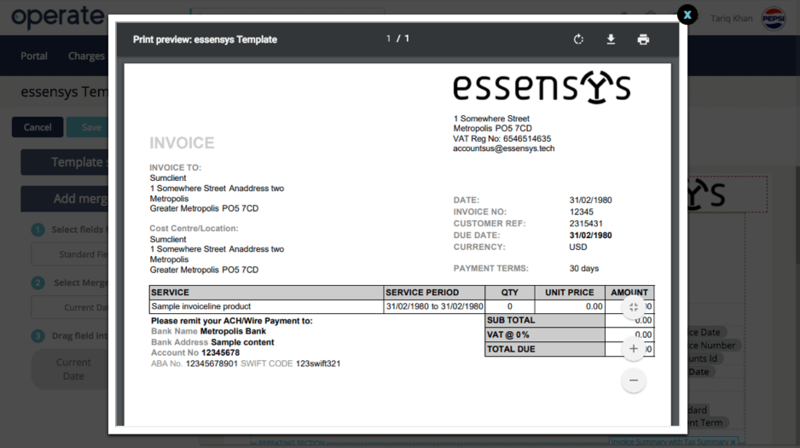 It is now possible to add invoice numbers to Operate without adding a prefix. The prefix field can therefore be left blank and the number will be implemented. Operators can now see where their leads came from. Within the leads records there is now a field called “Original Email To”, which can accept multiple emails. This will list the email address which the prospect has initially contacted. Operate's Space Publisher feature now contains a new aggregator: Croiisant. 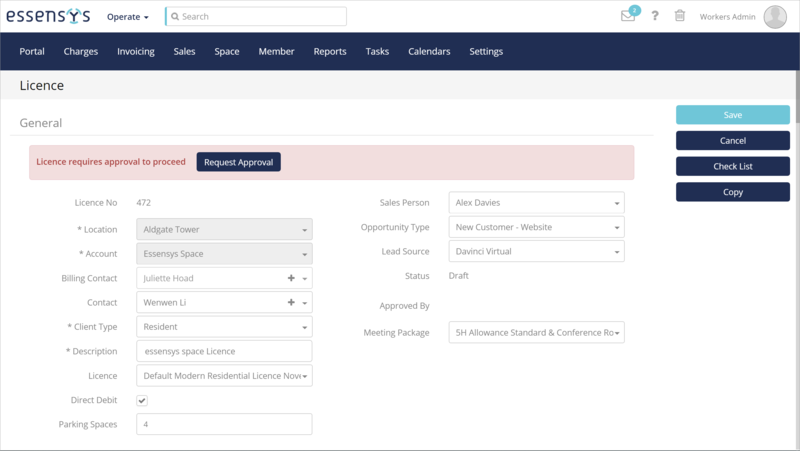 This can be used to list Operate meeting spaces for booking on this aggregator. The feature is available to all Operate customers. Operate can now create export .csv files for two new financial applications: Yardi and Access Dimensions. These can be installed from under Settings > Integrations. We have modified the license page to be more clear, so that users do not incorrectly use the system, When an end date on a license is modified you will be presented with a pop-up asking you to confirm whether you would like to update the charges associated with the license. Also when you extend the license, you will then be asked to check your charges on the license. 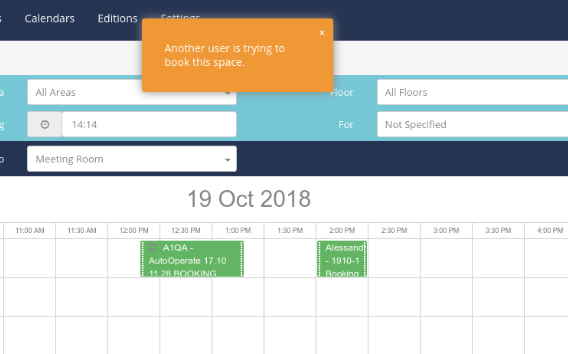 Operate will present a warning and inform you when a booking is being made in the calendar while another user is creating the same booking. When the ‘email opt out’ field is updated in a Contacts record, all Contacts with the same email address will be updated accordingly meaning that the Contact lists are GDPR compliant. 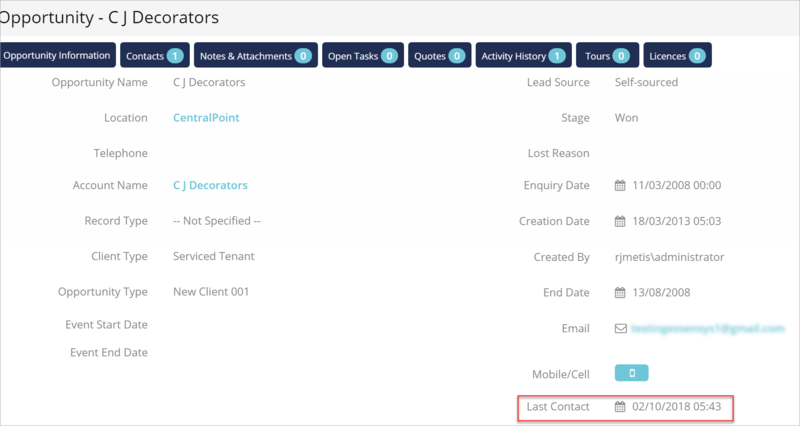 Operators can now view the last date recorded/most recent contact date in the activity history within an Opportunity record meaning they can track when a prospect has last been contacted so they can stay on top of opportunities and prospects. Operators are able to email all invoices/credit notes meaning users will not need to email each one individually. We have introduced United Arab Emirates Dirham (AED) the currencies accepted. After a licence has been approved, if it is edited or changed then it will now require re-approval ensuring a more secure process around editing licenses. We have added further logging for the payment processors so we can track what’s happening with payments. When a payment is made via the portal it’s details will be displayed in Accounts Receivable within Operate. Members of your accounting teams are now able to put different prefixes for both Credit Notes and Invoices, so as to keep them separate. For example when you drill down into locations you can add a field to the location. 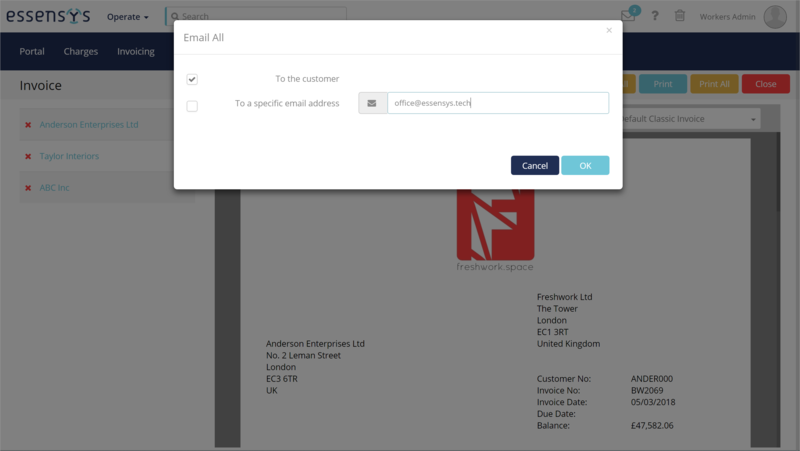 Operate can now handle email addresses with special characters, meaning international users can enter their email addresses. The platform also now accepts email addresses that include +1, +2. In addition to this, users can now store more than 1 email address within Licenses and also within Accounts > Billing Details > Invoice Email. In the event that a user accidently merges licenses we now provide the ability to un-merge licenses. We have made some changes to Connect, Operate and the Community Portal in accordance with The General Data Protection Regulation (GDPR). To learn more about these changes please read our GDPR articles for Connect, Operate and the Community Portal. After making a booking you will be able to edit and customise the booking confirmation form as you like. Simply click on the template and edit the form. The template editor now has a convenient print preview feature. This should alleviate the pain of guessing where page breaks naturally occur. It does not provide a preview of what the mergefields translate to, but does provide a very accurate illustration of how your document would appear once printed on paper or attached to an email as a PDF document. Mergefields are replaced by sample data. You are now able to include headers and footers to your documents. This feature also allowed us to implement the ability to include page numbers. ‘Page number’ and ‘Total pages’ are now available within the ‘Standard Fields’ merge fields section to drag/drop into your header or footer. We have improved Operate's performance when it comes to managing licenses that extend over a long period of time. We have implemented a filter that lets you select specific years on Licence items, when the billing period exceeds 25 months. If the billing period exceeds 25 months, Operate will only show the list of charges applied within the current year and will allow you to select subsequent years using a filter. It is now easier to see which reports have been scheduled in Operate. Now, if you receive a scheduled report, you can easily see who scheduled it, when it was last sent, and when it is next due to be sent. See this article for more detail. 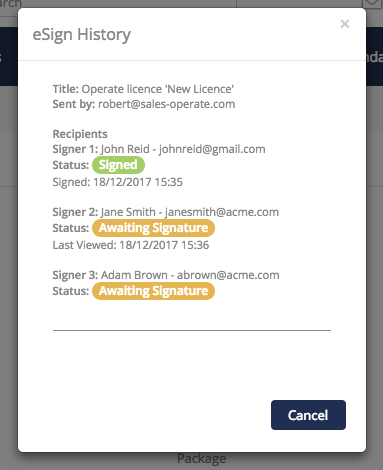 It is now easier to track your eSign licences with the new eSign History feature. Once your licence has been sent, you can see the status of each of your recipients and see at a glance whether they have viewed or signed the licence. Click here to find out more about eSign and how it can help you get your licences signed and contracts closed quickly and seamlessly. No more waiting around for your Bill Run to complete! You can now leave your Bill Run to process in the background and Operate will alert you on screen, and by email, when it has completed. This will allow you to start your Bill Run and leave it to run while you get on with other tasks. We have also made some speed improvements to the Bill Run so if you do choose to stay on the page while the Bill Run takes place, you should notice that it now completes more quickly. Learn more about your Bill Run here. We're happy to introduce our new eSign feature in Operate. You can send send, sign and store your licences automatically and seamlessly. Operate eSign is fully integrated with Operate. You can now avoid the manual, time consuming tasks involved with sending licences so you and your team can focus on delivering a great experience..
See here to find out more about eSign and how to activate it today! New Charge Sheet - Triggers when a new charge sheet is created. Update Charge Sheet - Triggers when a new charge sheet is updated. Delete Charge Sheet - Triggers when a new charge sheet is deleted. Create Charge Sheet - Creates a charge sheet. Update Charge Sheet - Updates a charge sheet. We have launched a new and improved version of our Operate API Reference. The essensys Operate API enables easy integration with other systems to enhance existing capabilities or build custom applications. Essentially it is there for anyone who wants to integrate with or build on top of the Operate platform e.g. a custom mobile app or integration. It can still be found in the same place, in Operate under Settings > Developer. It is now also publicly available at this URL. A link is available under the resources footer on the essensys website. The reference can be used to answer many questions for developers but it is important to understand it is a living document and will continue to change and grow. A Knowledge Base article regarding the API Reference can be found here. 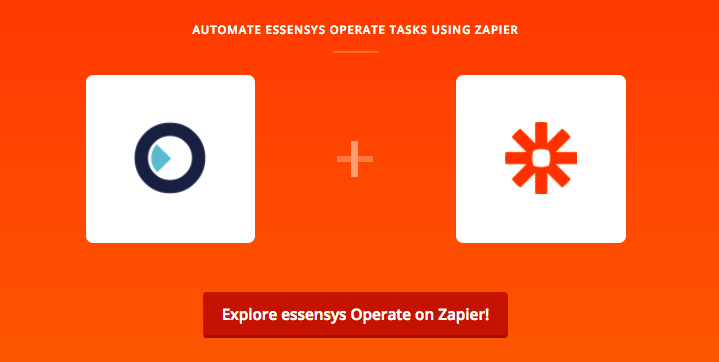 We are happy to announce that our Operate Zapier app is now officially live. Our customers now have the ability to create workflows between Operate and hundreds of other apps. If you would like examples of workflows or more information regarding our collaboration with Zapier you can view our knowledge base articles on the collaboration with Zapier and example workflows. We have introduced a new Checklist to help our new Operators get started. A Checklist icon will appear in the top right of your navigation if your organization has joined Operate recently. Within the Checklist, you will see several items listed, and you can see in real time which areas still require some set up or configuration. To the right hand side, you can see more detail about the item you're viewing, and find links to our Knowledge Base for more information. If you don't want to use the Checklist, select you can select Hide Checklist. Note that this will remove the Checklist icon from your navigation. If you want to turn your Checklist back on, just go to Settings > General/Getting Started, and select Checklist. You will be taken back to the Checklist, and it will be available in your navigation once again. A new homepage dashboard is now available for you to try out, which displays some key status updates from across your Organization. 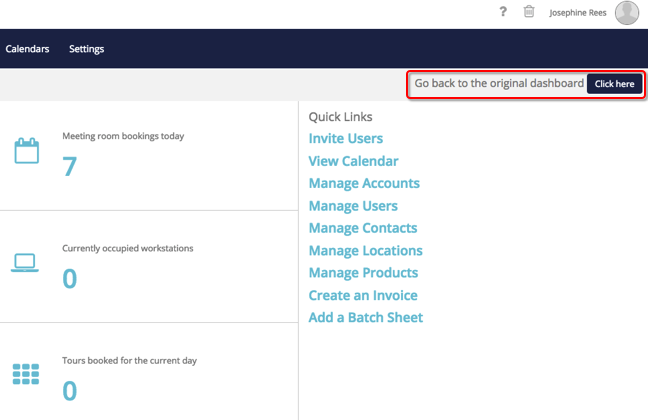 We have made the new dashboard available as a Beta, so you can try it out and still return to your original homepage. Just select 'Click here' in your navigation bar to switch between your views. 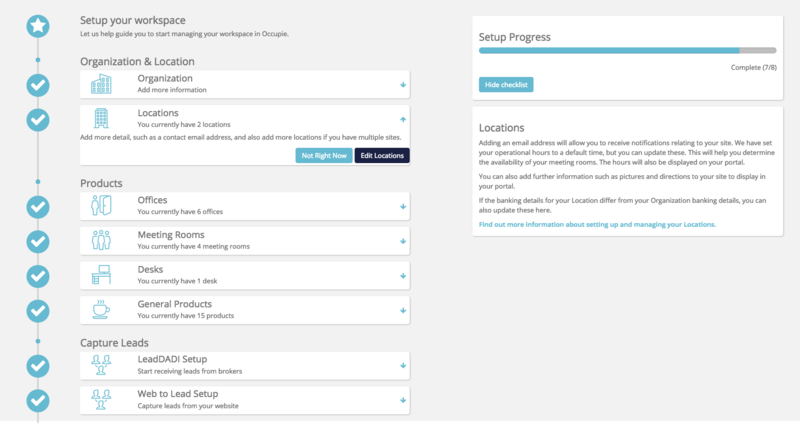 See here for information about new dashboard and the details displayed. We would love to hear your feedback! You can now integrate Operate with thousands of apps, including Slack, Hubspot, Trello, Mailchimp, and a host of others using Zapier. Required fields across Operate are now indicated with an asterisk symbol (*) so you can easily see which details on the page need to be filled in before saving. List views are now more intuitive, and will remember the view you had selected in your previous session. For example, if you had last selected to view 'Accounts with a balance' on the Accounts page, this view will still be selected when you next return to the page. We are always working to improve your Operate experience, and from today you will notice some enhancements to the overall usability and speed while navigating around Operate. You will also see an improvement when searching in list views - you can now filter results in real time instead of entering and submitting search term and waiting for your results.